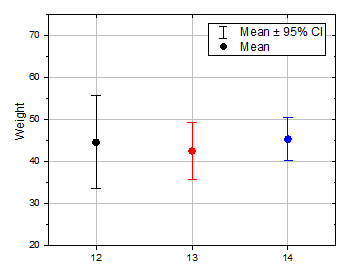 This plot will show you how to create an interval plot from raw data and indexed data. 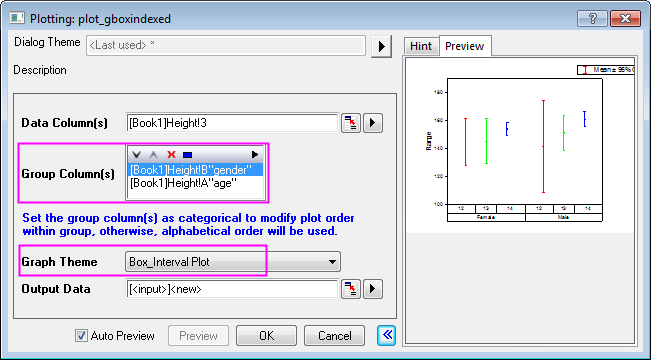 If you would like to work through these steps with me, download Interval_Plot_Sample_Data.zip file, extract the contents and open the OPJ file. In the active worksheet Weight, we can see there are three columns 12, 13, 14 (Comments) which recorded the weights of a group of students at age 12, 13, 14,respectively. 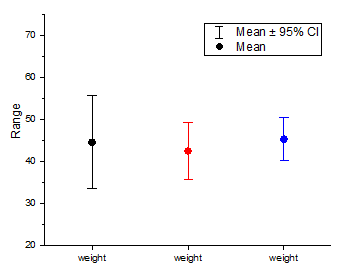 This is the data we prepared for making a simple interval plot. 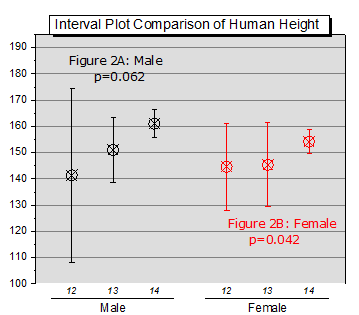 If you click on Height sheet, you will see the Age, gender, height(Long Name) columns which will be used to demonstrate how to create a grouped interval plot. Simply highlight all three columns in Weight sheet and go to menu Plot: Statistics: Interval Plot to make the interval plot. 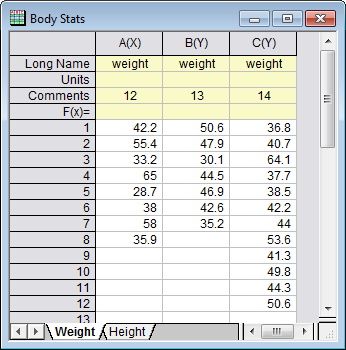 You may notice that the X axis labels are all weight, to change it to use Comments label row instead, you can double click right on the X axis tick label to bring up X Axis dialog. With Tick Labels: Display tab active, select Comments as Display drop-down option and click Apply button on the bottom to see the effect. You can continue to make further customizations, below is a sample design. 1. Go to Height sheet, highlight column height (Long Name) and go to menu Plot: Statistics: Grouped Box Charts – Indexed Data… to open dialog. 2. 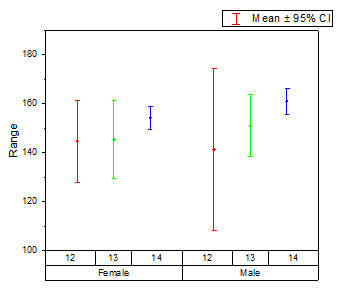 Add gender column then age column as Group Column(s) and select Box_Interval Plot theme as Graph Theme option. 4. You can include some analysis results as text labels in the graph and do customizations at your desire. Below is a sample plot which can seen in our New Graph Types in Origin 2016 sample opj.